I've been watching a lot of TV lately. Just finished up West world season 1, The Alienist, and season 1 of the Frankenstein chronicles. All of which are really good! I highly recommend them. So here's the idea, I've always been a HUGE fan of the old horror movies, Lon Chaney, Bella Lugosi, Boris Karloff, Claude Rains, the list is never ending honestly. 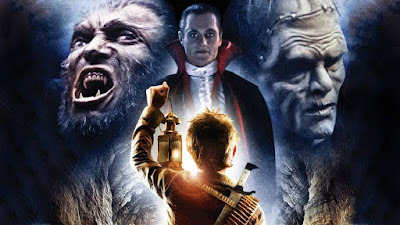 Another movie I absolutely loved when I was a kid was Monster Squad! Of course you can throw in some Penny Dreadful into the mix as well. Setting: Early 1800's English Countryside, and England (well sort of). System: Lotfp (with black powder guns), or maybe Call of Cthulhu. I just realized this could totally work for DP&D as well! The rabbit hole leads the PCs to all the great monsters from the horror movies, Frankie, Dracula, Werewolves, etc. It's up to them to find out what's happening and stop it. It's going to be campy, just like those movies, it's going to be scary. The twist of course, unlike West World, and much like Total Recall the PCs can die in the world.